Germany has an efficient and internationally competitive maritime economy of high macroeconomic importance. With more than 400,000 employees and annual volume of €50 billion, it is one of the most important branches of the German economy. It is characterised by a modern and highly specialised shipbuilding and supply industry, internationally leading shipping companies, and effective port industries and logistics. The German commercial fleet consists of about 325 cargo vessels under the German flag with a gross tonnage of about 9.1 million (mainly container and general cargo vessels) and 2,003 cargo vessels temporarily under foreign flags with a gross tonnage of about 51 million (mainly under the flags of Liberia or Antigua and Barbuda). The German commercial fleet holds a market share of nearly 9 per cent and is the youngest, most modern and one of the largest commercial fleets in the world. With about 4.8 million TEUs, German container ships supply about 25 per cent of the container ship capacity worldwide. German shipowners employ about 71,000 seafarers on board their ships and about 24,000 employees ashore. German sea ports handle an annual cargo volume of 300 million tonnes and provide 300,000 jobs. German shipyards have generated an annual volume of between €4 billion and €7 billion in the past four years and have employed between 16,000 and 19,000 workers.2 The German shipbuilding industry holds a good market position in the area of passenger and cruise ships, yachts, modern ferries and special ships of any kind. It is also engaged in the construction of offshore platforms. The German maritime trade law is mainly codified in Book 5 of the German Commercial Code (HGB).3 On 25 April 2013, the reform of German maritime trade law came into force, including modifications to transport law in general. The main purpose of the reform was to modernise and adjust German maritime law to current economic conditions. Besides the HGB, applicable maritime law can be found in various national statutes and international conventions. The numerous international conventions that apply under German law are either incorporated in the HGB or apply directly, depending on their regulatory content. Shipping disputes are litigated within the system of ordinary courts; there are no special courts for shipping disputes. Within the system of ordinary courts, however, there are chambers of commercial law, which consist of one professional judge (chairman) and two honorary judges (merchants or business executives) as ‘commercial judges’. These chambers within the regional courts deal exclusively with commercial matters and thus have a more comprehensive knowledge of these subjects. The German Maritime Arbitration Association (GMAA) provides a set of arbitration rules for arbitration in all maritime matters. Since its founding in 1983, dispute resolution under the GMAA is the most common form of arbitration for shipping-related matters. The GMAA is in close contact with the LMAA, the Society of Maritime Arbitrators and other important organisations for maritime arbitration, especially via the International Congress of Maritime Arbitrators Conferences. Under the GMAA rules, as there are no restrictions as to the choice of arbitrators (no numerus clausus), parties can always nominate the most qualified arbitrators. Another major advantage of a GMAA procedure is the fact that there is no ‘discovery’ and significantly shorter oral proceedings, which streamline the arbitration and save both time and money. Foreign judgments and arbitral awards can be enforced if they are recognised by a German court in line with Section 328 and Section 1061 of the German Code of Civil Procedure. The acceptance of a foreign ruling is determined by Regulation (EC) No. 1215/2012 of 12 December 2012 (Brussels I bis).The Lugano Convention of 30 October 2007 applies subsidiary for rulings from countries of the European Free Trade Association. If the acceptance of a foreign ruling is not determined by these international regulations, the main condition for acceptance in accordance with Section 328 of the German Code of Civil Procedure is that the foreign state basically provides equivalent conditions for the enforcement of a ruling of similar nature. The acceptance of a foreign arbitral award is based upon Section 1061 of the German Code of Civil Procedure, which simply refers to the New York Convention. Based upon the reference in Section 1061, the Convention also applies in relation to arbitral awards of non-party states. A shipbuilding contract is considered to be a contract for the sale of goods by virtue of Section 650 of the German Civil Code. As shipbuilding contracts are subject to general sales provisions, the parties to such a contract have to customise their contractual agreements to comply with the specific requirements and complexities of a shipbuilding contract. After completion of the building process, the buyer is obliged to examine the vessel immediately after its delivery and give notice of discovery of any defects. If the buyer fails to do so, any claims for defects are considered as precluded. As to the choice of law clauses in a shipbuilding contract, the applicable law can be freely chosen by the parties, even if the law governing property rights and other rights in rem is governed by the law of the country where the ship under construction is registered. There are no special courts for shipbuilding matters; however, parties almost always agree on the jurisdiction of the courts of Hamburg or Bremen, or choose arbitration. Under German law there is a distinction between contracts for the carriage of goods by sea and charter contracts. Contracts for the carriage of goods by sea are regulated in Sections 481 to 535 of the HGB while charter contracts are regulated in Sections 553 to 569 of the HGB. German law distinguishes between contracts for the carriage of general cargo and voyage charter contracts. Even if the voyage charter closely resembles a charter contract, it is thought of as a contract of carriage, which means international conventions also apply. The contract for the carriage of general cargo4 is the fundamental contract type for the carriage of goods by sea. By virtue of such a contract, a carrier is obliged to transport the goods to their destination and to deliver them to the consignee. Therefore, the carrier has to ensure that the vessel is in a seaworthy condition and properly furnished, equipped and manned, and sufficiently supplied. The parties to a contract for the carriage of general cargo may only diverge from the statutory provisions regarding the carrier’s liability if they negotiate their particulars individually. Thus a divergence by standard terms and conditions is not possible. As a result, ‘period of responsibility clauses’5 in standard terms are no longer valid under the German maritime trade law that has been in force since 25 April 2013. Even though a divergence from the statutory provisions regarding the carrier’s liability is not possible, carriers and freight forwarders used to operate under the German Freight Forwarders’ Standard Terms and Conditions (ADSp) to deviate from other mandatory provision. Between 1927 and 2015, the ADSp were jointly issued by shippers and carriers and thus achieved a high penetration of the market. However, during the negotiation regarding the 2016 version of the ADSp, shippers and carriers did not find an acceptable compromise, which resulted in two sets of terms and conditions. The German Transport and Storage Conditions (DTLB) were intended for use by shippers, and the ADSp 2016 was intended for use by carriers. However, during the course of 2016, both shippers and carriers realised the benefit of jointly issued terms and conditions. Since 2017, both sides issue jointly agreed terms and conditions once again, having agreed on the 2017 version of the German Freight Forwarders’ Standard Terms and Conditions (ADSp 2017). By virtue of the voyage charter contract,6 the carrier is obliged to carry goods to their destination, in one or more specified voyages by sea, using either the whole of a specified vessel, a proportion of a specified vessel or a specifically designated space within a vessel, and to deliver the goods to the consignee. The provisions for these contracts are basically those applicable to voyage charter contracts. As the provisions of the voyage charter contract can be modified, these contracts are de facto regularly based upon international standard terms such as GENCON, BALTIME or NYPE-C/Ps. Thus, the applicable law is nearly always determined by choice-of-law and jurisdiction clauses. Germany signed the Hague Rules in 1924 and incorporated their provisions into the HGB. Thus the Hague Rules do not apply directly but are applicable via the HGB. Germany has not signed the Hague-Visby Rules. Nevertheless, these provisions were also implemented by incorporation into the HGB. Germany has not signed the Hamburg Rules or the Rotterdam Rules, so these conventions do not apply directly, indirectly or by incorporation. The provisions for accompanying documents have also been revised with the reform of German maritime trade law. 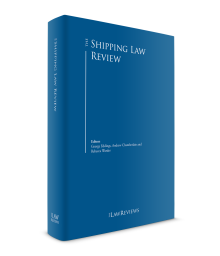 For the first time, the law mentions the sea waybill beside its provisions concerning bills of lading. Section 526 of the HGB gives the carrier the right to issue a sea waybill instead of a bill of lading. A sea waybill serves as prima facie evidence of the conclusion and content of the contract for the carriage of general cargo, and of the fact that the carrier has taken over the goods. Because of the reform of German maritime trade law, charter contracts for vessels have been statutorily regulated for the first time. The law distinguishes between bareboat and time charter contracts. While bareboat charter contracts are mainly assigned to the common provisions of rent in the German Civil Code, the time charter is defined as a charter contract sui generis; however, what both contract types have in common is that they are de facto governed by the established charter forms, such as NYPE-C/P or BALTIME-C/P, as the provisions for charter contracts are modifiable. The rules relating to the liability for loss or damage are based on the model of the Hague Rules and the Hague-Visby Rules. Accordingly, a carrier is liable for any damage resulting from the loss of or physical damage to the goods occurring while in its custody (Section 498 of the HGB). This liability is created as liability for presumed fault. The carrier is only released from this liability insofar as the loss of or physical damage to the goods was due to circumstances that could not have been avoided by a prudent carrier exercising due care. These circumstances have to be proven by the carrier to free itself of its liability. If the goods were carried by a vessel that was not in a seaworthy or cargo-worthy condition, and if the facts of the case indicate a likelihood that the goods were lost or physically damaged because of the ship’s lack of seaworthiness or cargo-worthiness, the carrier is released from its liability only if it can prove that the lack of seaworthiness or cargo-worthiness could not have been discovered before commencement of the journey by a prudent carrier exercising due care. Where the carriage is performed, in whole or in part, by a third party who is not the contractual carrier, that third party (performing or actual carrier) is liable in the same way as the contractual carrier for any damages resulting from the loss of or physical damage to the goods. As a result, terminal and port operators might be liable as ‘performing carrier’. The consignee or shipper has to notify the carrier on delivery of the goods if they are externally apparently damaged or incomplete, and within three days of delivery if the damage or incompleteness was not immediately externally apparent. Otherwise, there is a presumption that the goods were delivered in their entirety and in an undamaged condition. Goods are considered lost if delivery has not taken place within a period twice as long as the agreed delivery period, but at least 30 days. Liability claims become time-barred after one year, beginning on the date on which the goods are delivered or, failing delivery, on the date the goods should have been delivered. The limitation period for recourse claims of an obligor in a liability claim, however, begins on the day on which the judgment against the recourse claimant becomes final and non-reviewable or, in the event that no legally final and non-reviewable judgment exists, on the day on which the recourse claimant has satisfied the claim. This does not apply if the recourse debtor was not informed of the damage within three months of the recourse claimant becoming aware of the damage and of the recourse debtor’s identity. Claims for damages caused by delay, however, will only become time-barred after three years, in accordance with the general provisions of the German Civil Code. This limitation period commences at the end of the year in which the claim arose. Germany is a contracting state to the 1996 LLMC Protocol. The Protocol was published in the Federal Law Gazette in Germany on 27 June 2000. Article 4 provides that the Protocol shall enter into force one day after its publication. Therefore, the limits apply to incidents as of 28 June 2000. The regulation applies to all contracting states to the 1996 LLMC Protocol, but not to those which are only Parties to the 1976 LLMC treaty. This treaty was terminated by Germany on 13 May 2004. Besides the general exclusion of liability for carriers exercising due care, a carrier is not liable for damages excluded in Article 4, Section 2 of the Hague Rules, which is incorporated in Section 499 of the HGB. In addition to the provisions of the Hague Rules, there is an exclusion of liability for the carriage of live animals; however, under the newly amended HGB, there is no longer an exclusion of liability for error in navigation or fire or explosion on board the ship. The parties are nevertheless free to adopt a provision for the said exclusion via standard terms. In general, the carrier has to compensate for the value of the goods. Insofar as the carrier is liable to pay compensation for the total or partial loss of goods, the amount is calculated by reference to the value that the goods would have had if they had been delivered in due time at the destination contractually agreed. As regards physical damage to the goods, the measure of the damages payable is the difference between the value of the damaged goods at the place and time of delivery and the value the goods would have had at the place and time of delivery had they not been physically damaged. Notwithstanding these regulations, the liability of a carrier is unlimited if the goods were loaded and stowed on deck even though the carrier had agreed with the shipper or the Ablader that the goods were to be carried below deck, or the damage was caused by an act or omission of the carrier, done with the intent of causing damage, or recklessly and with knowledge that damage was likely to be caused. In principle under German law, there is no special regime for vessel arrests and so the general rules for conservatory measures of the German Code of Civil Procedure apply. Within these general provisions, there are some regulations with special reference to ship arrests that alter the general rules. Most importantly, the reform of German maritime trade law altered the requirements for ship arrests, theoretically making the arrest of a vessel easier and far less risky than before as, according to the wording of the new law, the need for grounds for the arrest has vanished. However, in recent commentaries on the German Civil Procedural Code,11 it is argued that the requirement for grounds for the arrest was removed only in respect of maritime liens. As a judge dealing with an arrest case might not be very experienced in respect of arresting vessels and might look at these commentaries, it is quite possible that a judge would still argue that there has to be an arrest ground. Germany is a member of the Arrest Convention of 1952 (but not of the 1999 Convention), which applies directly. If the Arrest Convention applies, only maritime claims as listed in Article 1 of the Convention may justify the arrest of a vessel. Outside the Convention, any claim for money or any claim that may turn into a claim for money may justify an arrest. Further preconditions exist in German procedural law. Under German law, the assets of a debtor can only be attached if the creditor holds a legal title (e.g., an enforceable judgment or arbitration award). The arrest is an exception to this rule, but for conservatory purposes only. Therefore, the creditor has to bring prima facie evidence that it has a claim against the owner of the vessel or the bareboat or demise charterer. The objective of an arrest may only be an item legally (not beneficially) owned by the debtor. Therefore, if the debtor (the same legal entity) legally owns more than one ship, all its ships are ‘sister ships’ and can be the object of an arrest. There are two exceptions to the principle that the arrested item must belong to the debtor: first, if the creditor has a claim against the ship, which gives it a maritime lien in accordance with Section 596 of the HGB, an arrest is possible notwithstanding the fact that the debtor may no longer be the actual owner; second, as a result of the fact that, according to Section 477 of the HGB, a bareboat or demise charterer is regarded as the owner of a vessel, the arrest of a vessel is also possible for claims against the bareboat or demise charterer (but not against a time charterer). The arrest application is to be filed either in the court that has jurisdiction for the main proceedings or (most common) in the local district court in which the vessel is located. These courts are not specialised in maritime matters, but staffed by ordinary judges (who usually deal with rather minor affairs). After the filing of a justified application form, the court will render the relevant arrest order (normally, without an oral hearing). With this order the court will rule out a certain period of time within which the applicant must pursue the claim on its merits. The arrest order is executed at the request of the arrest applicant by the competent bailiff who takes possession of the ship. Enforcing the arrest upon a vessel is inadmissible if the vessel is travelling and not lying at harbour. Further, the execution of the arrest order must take place within one month of its date of issue. In addition, the arrest must be served upon the debtor within one week of its execution, which can now (since the reform) be accomplished by serving the order on the captain on board the vessel. In the event of a wrongful arrest or the expiry of the time fixed by the court to start main proceedings, there is strict liability on the arrest applicant for all damage suffered by the vessel owner because of the arrest. For this liability, no negligence or bad faith is required on the part of the applicant. An arrest can be lifted if the defendant provides the applicant with the amount fixed in the arrest decision as a security. The security can either be provided in cash or transferred to the account of the court or be in the form of a bank guarantee. As this security safeguards the applicant’s rights, it should cover the claim plus interest and costs. As for the deposit of a counter-security, the decision as to whether the applicant has to supply security and, if so, to what amount, is at the discretion of the court. In practice, courts almost always ask for counter-security. Whether this will change in the light of the recent reform – as has been argued by some commentators – remains to be seen. Therefore, when preparing an arrest, it is wise to argue that no counter-security may be requested, but to nevertheless be prepared to arrange quick bank transfers or guarantees. To effect the judicial sale of a German ship, the ship has to be located in a German port. The creditor then has to apply to the district court for enforcement. Upon receipt and publication of an expert opinion on the value of the vessel, the court will set an auction date. At the auction, anyone can bid provided they can provide evidence of the ability to pay the bid. A judicial sale will dispose of all third-party rights in rem according to German law. This effect should be recognised by other jurisdictions (in particular EU Member States); however, for some jurisdictions, the risk of third-party rights in rem or arrest remains. The proceedings of a judicial sale will last a minimum of four months from application, depending on how quickly the court processes the matter and the expert report is available. A private sale is possible, but is accompanied by the risk that third-party rights in rem will not be affected by it. In addition, a judicial sale for foreign vessels can only be effected in Germany if the debtor has the ship in its proprietary possession. Regarding ship safety, the rules of the ISPS Code, the ISM Code and SOLAS apply under German law. Germany is member of the 1982 Paris MOU. The new inspection regime under the Paris MOU came into force on 1 January 2011. Directive 2009/16/EC of the European Parliament and of the Council of 23 April 2009 on port state control has been transposed into German law. Ships are chosen for inspection in accordance with the criteria of the Paris MOU and European port state control guidelines. The competent authority for the execution of port state control in Germany is the Ship Safety Division of the Professional Association for Transport and Transport Economics. A German-owned ocean-going ship of 15 metres in length or more must be listed in the register of its home port (first register). A German-owned ocean-going ship remains on the first register even if it changes temporarily to a foreign flag under a bareboat registration.13 Mortgages on ships in the first register can also be registered and remain registered even if the ship is flagged out under a bareboat registration. A registration in the GIS is not mandatory. Every German-flagged ship that operates in international trade can be registered in the GIS, allowing different employment and social security rules to apply. Germanischer Lloyd, a German classification society with a good international reputation, merged with the Norwegian classification society Det Norske Veritas to form DNV GL in 2013. DNV GL’s classification department is still seated in Hamburg. With regard to the liability of classification societies under German law, there are no special maritime provisions regarding this liability. Thus, a classification society is liable to its principal in accordance with the regulations of the German Civil Code regarding contractual liability. The liability towards third parties, however, is more complicated and based on the existence of a special relationship of trust. Thus, the question of whether a classification society can be held liable by a third party has to be assessed in each case. Germany is a party to MARPOL (73/78), and has ratified the Anti-Fouling Convention and the Ballast Water Management Convention. The ISMBC Code, the IMDG Code and the IBC Code also apply in Germany. Germany is member of the Collision Convention 1910, the Collision Convention 1952, the COLREGs and the Nairobi WRC 2007. The LLMC Convention 1976 has been incorporated into the HGB and so is also applicable under German law. German law contains regulations regarding contracts for the carriage of passengers and their luggage in Sections 536 to 552 of the HGB. These provisions have been modelled on Regulation (EC) No. 392/2009 of 23 April 2009 (the Athens Regulation) and the Athens Convention. The Athens Regulation also applies directly and supersedes domestic law. The Athens Convention is not in force in Germany. The regulations regarding contracts for the carriage of passengers and their luggage in the Commercial Code are restricted to the liability of the carrier towards the passengers. Beyond that, the general provisions of the Civil Code apply. Germany has signed the Maritime Labour Convention 2006 (MLC). The MLC was implemented in the Maritime Labour Act of 2013, which contains special regulations for maritime labour law. Additionally, general labour law provisions apply where no special regulations exist. Further, SOLAS and the STCW Convention apply under German law. Germany reformed its maritime trade law with effect from 25 April 2013. This reform had been demanded and anticipated for a long time, as the former German maritime trade law was long since outdated. The new law revises the statute law to today’s standards and brings it into line with the needs of the maritime economy. As such, a major reform has been effected, there are currently no further major legislative projects in prospect. One issue that the German legislator will have to deal with in the coming years is whether the Rotterdam Rules will be adopted. For the time being, Germany has not signed that Convention but rather continues to observe the approach of the other states with major maritime industries. 1 Olaf Hartenstein and Marco Remiorz are partners and Marcus Webersberger is a counsel at Arnecke Sibeth Dabelstein. 2 All figures quoted in Section I have been issued by the German Ministry of Economics and the Federal Maritime and Hydrographic Agency. 3 The revised Commercial Code, published in the Federal Law Gazette, Part III, Section 4100-1, as amended by Article 1 of the Act of 20 April 2013 (Federal Law Gazette, page 831). 4 Sections 481 to 526 of the HGB. 6 Sections 527 to 535. 7 BGH Urteil von 15 February 2007 – I ZR 40/04, TranspR 2007, 119. 8 Czerwenka, Das Gesetz zur Reform des Seehandelsrechts (2013), Section 505, Rn.1. 9 HansOLG Hamburg, TranspR 2012, 382. 10 HansOLG Hamburg, MDR 2012, 720. 11 Zöller, Section 917, Rn. 19; Thomas/Putzo, Section 917, Rn. 5.